The main thing it was missing was a driver. My regular CoC opponent Phil put me on to Warlord’s nice little driver miniature (complete with fag hanging out of his mouth) and he fits nicely without any modification. Result! 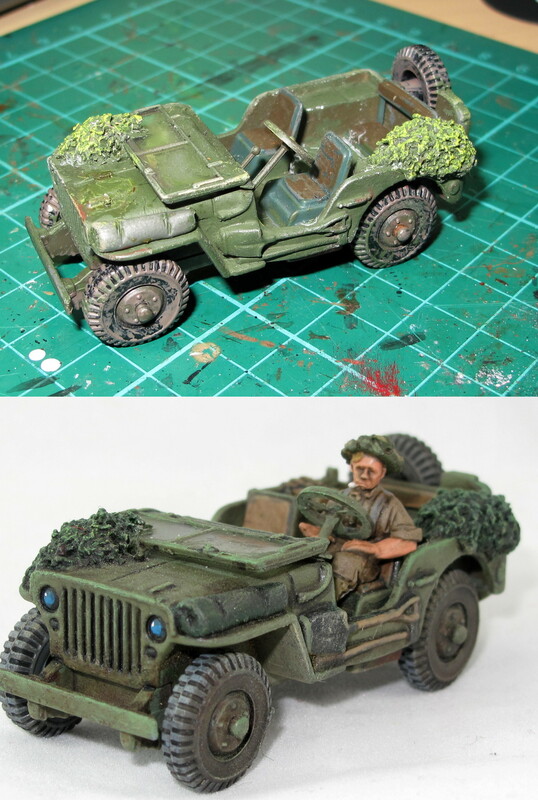 The die-cast jeep itself is actually a good model, but the previous owner had added some blobs of lime green cam net that looked a bit odd, and the paint job needed a bit of a touch up. While I was at it I added some gear; the driver’s small pack and a sten for when traffic on the road to Berlin got gnarly. Luminous cam nets, dodgy tyres, unpainted tools, etc. I added a little bit of stowage and the driver. The windscreen already had some paint on it so I had to scrape that off, and none of the detail (tools, headlights, etc) had been painted. I almost went for a full respray but in the end just touched up the base paint job in a few places before chucking the trusty Army Painter Strong Tone ink all over it. It instantly looked 100% better, and with a pin wash, highlight and touch of weathering I’m calling it done. I really like this Warlord driver mini, tons of character. A lot of what I’ve done is add details. Headlights, tail lights, stowage, tools, etc all bring a vehicle to life. One of the worst parts of the old paint job were the tyres, they were just a blotchy mess. My recipe for types is just paint ’em grey, wash with black ink, then drybrush the treads grey again. They get a bit of dirt colour when I get to the weathering stage, but tyres actually don’t stay that dirty IMO. I put a lot more dust and dirt on the chassis and wheel arches. All up this was a pretty quick and enjoyable job. It’s a miniature I’ve already used in a few games, and I’ll be a lot happier with how it looks the next time I do. Your done a great rebirth on the jeep, looks excellent Andy. Thank you most kindly, mystery guest!